You have a passion for Jesus. You want to do the right thing for His disciples. You believe in a better digital experience. You are on a journey. This is a world that brings about radical change for your ministry. Your journey will require that you master “change management”. “Change management” is your primary role as a visionary who truly believes your ministry can end up in a better place with more reach for God and with an improved bottom line to fund it. Much of the Good News message is about changing our mind. We are missing God’s goal. Jesus challenges us to see that and change how we think and what we do. Is it possible that part of the mission of Jesus involves reaching the world through a radically different digital experience? 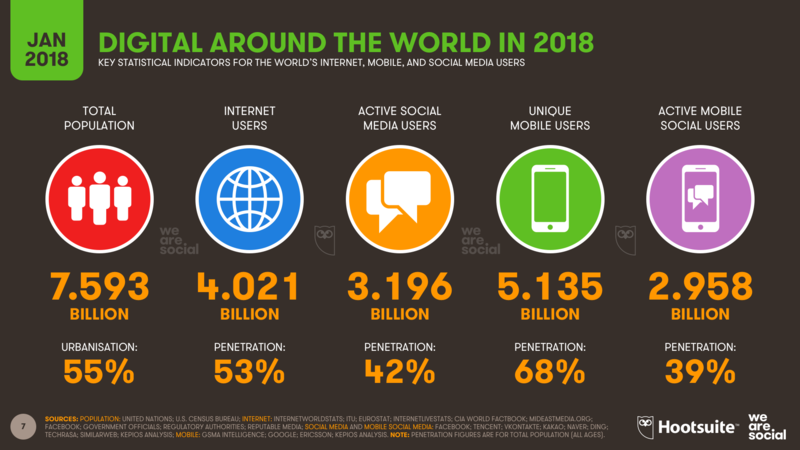 The new 2018 Global Digital suite of reports from We Are Social and Hootsuite reveals that there are now more than 4 billion people around the world using the internet. In kindness he takes us firmly by the hand and leads us into a radical life-change. You are a champion of transformation and innovation in your ministry. You will face a lot of challenges. It will require hard work, perseverance and support from many. You will discover many allies and a few enemies. Part of your work is about discovery. Much of it is about communication and formulation of strategy. A focus on going from strategy to a few actionable next steps is critical. This is definitely hard work. If you are up to it, which is precisely why it is interesting. Not everyone can lead the way. All the hard work will lead to the reward. Unparalleled growth for God is the promise of an enriched discipleship experience. Too often, the connected discipleship experience of your ministry is an afterthought. Your main focus is to become intentional about everything you can push into an online experience. So for example, if I was out of town, could I worship with you on my laptop or smartphone? Can I donate online or on my smartphone? Can I pray with you by video? Can I participate in an online discipleship experience that is systematic? Do you offer online courses and seminars? To bring the issues front and center, you and others need to champion internal transformation. It doesn’t matter that you are unclear where to begin right now. Getting started will help you figure it out. You are going to need lots of helpers. And you probably need at least one mentor. Acknowledging that the world is changing may be a wonderful place to start. We know the connected disciple (member) behavior is changing rapidly. It is impacting how members view your ministry. Documenting how it is impacting your ministry is another key focus area. It is already impacting your bottom line. Another focus of the journey may be to break a few deadly habits. We all have habits. One ministry habit is seeing member giving (tithing) from the view of a single tithing transaction. This is called direct response. This habit can cause you to miss the member (they are a millionaire) who has recently made a series of small giving transactions. What experience did they just have with you? As a result of that experience, are they on a journey with you to engagement with your ministry? Moving from a transaction mindset to a relational and engagement mindset can remarkably impact the experience the disciple (member) has. This has huge rippling effects into loyalty to God, your ministry and total giving. I am constantly surprised by how many church websites don’t even highlight how to donate or give much less enable it online. There is generally no to little gratitude expressed for the gift. There is no stewardship letting the donor (tither) know how their gifts are being used. The Apostle Paul took great care to make sure the giving experience was well thought out. Do your givers delight in giving? Is that the kind of experience you have intentionally designed for them? What does that look like digitally? And so … it is a journey. The connected disciple (member) behavior is changing and changing fast. As a hero leading the journey internally, it is your role to help leaders see the impact to the experience with God, your bottom line and to help everyone keep up. It is a good thing our world is changing. Embrace it for God. Lead the change in your ministry. God is with you. What a great reminder and an encouragement that we Christian bloggers are a part of something big! But what we need to be doing is finding more ways to increase our penetration into Gospel-starved demographics, not just pandering to the faithful. Yes, there is plenty of room for larger, more organized and financially-capable ministries to take advantage of the global web opportunity. However, we should encourage more gifted writers and Christians on social media to take advantage of this unprecedented opportunity to reach the lost, one person, one click at a time. Very well said. I’m very active on Twitter, mainly dealing with the atheist, agnostic and non-religious world. It can get pretty ugly but it is ministry to get the word out to those who need it, not just the faithful. We need more who are willing to put on the full armor of God and fight the good fight for Jesus. Well said. Some really good food for thought. Thanks. It is definitely interesting.